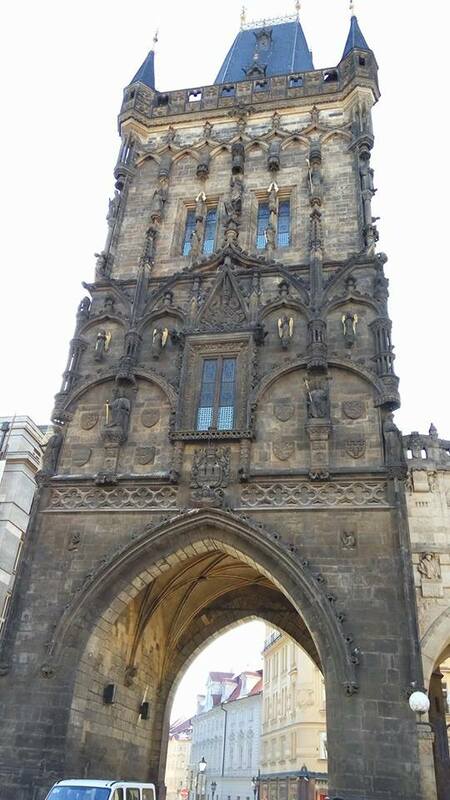 The gate was built as a part of town fortification and through which led the road to Kutna Hora and eastern Bohemia. 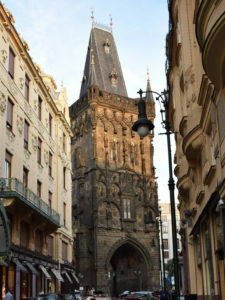 The tower was built after 1475 by late Gothic architect Matej Rejsek for the King Vladislav Jagellon on the site of the Odrana Gate. Originally it was named Mountain Tower and its name Powder Tower gained only in the 17th century when a store of gunpowder was kept there. Next to the tower used to stand the Royal Court, the short lived residence of the Czech rulers. The court was founded by king Wenceslas IV and was inhabited later by Zikmund of Luxemburg, Posthumus or George of Podebrady. King Vladislav Jagellon moved from here in the end back to the Castle in 1483. 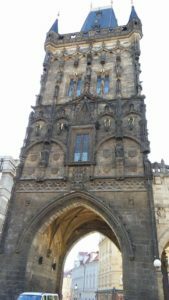 Most of the decoration has been destroyed over time, especially in 1757 when Prague was besieged by Prussian troops. A large part of the modern decoration was done between 1875 – 1886, carried out by Josef Mocker. In the past from here also used to start so called Kings Route that used be taken by Czech rulers to the Castle via today’s Celetna street, Old Town Square, Small Square, Charles Bridge, Mostecka street, Little Quarter Square and Nerudova street.